Today, Members of the Senate and Congressional Western Caucus released statements praising the confirmation of David Bernhardt in the U.S. Senate as the 53rd Secretary of the Department of the Interior. Senate Western Caucus Chairman Steve Daines (MT): "David Bernhardt understands the importance of protecting access to our public lands, our commitment to tribal nations, and responsible energy development. As a fellow westerner, I have complete confidence in David’s ability to lead the Department of the Interior and was glad to cast my vote for him this afternoon along with a bipartisan majority on the floor of the United States Senate. I look forward to continuing to work together to advance Montana priorities." Congressional Western Caucus Chairman Paul Gosar (AZ-04): "Today is a great day for America, freedom and the rule of law. 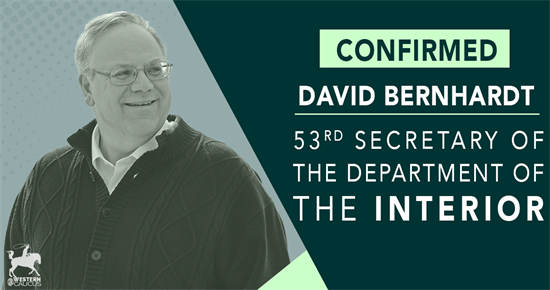 I am thrilled to see David Bernhardt confirmed as the 53rd Secretary of the Interior. From day one, David has been an asset to the Department. His strong work ethic, breadth of knowledge on the issues and integrity make clear why he was confirmed today with strong bipartisan support. I am confident that by the end of his tenure, David Bernhardt will be the greatest leader in the history of the Department. The future is bright with David at the helm. Congratulations, Mr. Secretary!" Senate Energy and Natural Resources Committee Chairman Lisa Murkowski (AK): "I congratulate Mr. Bernhardt on his confirmation to be Secretary of the Interior. He has what it takes to lead this Department – coming from the west, he understands our public lands, has more experience at the Department than all but one of his predecessors, and has extensive knowledge of the issues that will come before him. David Bernhardt has proven to be a strong partner not only for Alaska, but states all across the country. I’m pleased to continue working with him and his team on a wide range of energy, lands, and water-related issues." House Republican Conference Chair Liz Cheney (WY-At Large): "Secretary David Bernhardt's years of experience working on energy, public land, and natural resource issues in the West, including his time at the Department of the Interior during the Bush-Cheney Administration, makes him exceptionally qualified to lead the department. While serving as Deputy Secretary, Bernhardt focused on rolling back regulations, reducing unnecessary government overhead and improving land management. He has been instrumental in restoring local voices in management decisions and expediting the permitting process for ranchers, sportsmen, and operators in Wyoming. I congratulate him on his confirmation and am pleased to continue working with him in his new role to protect and preserve our western way of life." House Natural Resources Committee Republican Leader Rob Bishop (UT-01): "After decades of mismanagement and regulatory abuse, the Department of the Interior and the communities impacted by its decisions will greatly benefit with David Bernhardt at the top. He is uniquely qualified to lead the Department and continue important regulatory reforms to improve land management, limit prior executive abuse, expand conservation, and advance greater public access to our public lands. I congratulate David on today’s confirmation." Senate Indian Affairs Committee Chairman John Hoeven (ND): "David Bernhardt has a strong background and the right experience to serve as Secretary of the Interior Department. Now that he has been confirmed, we look forward to working with him to advance the responsible, multiple uses of our public lands. That includes grazing, energy development and recreation." House Energy and Commerce Committee Republican Leader Greg Walden (OR-02): "David Bernhardt is a consummate professional that will bring experience, integrity, and leadership to the Department of the Interior. I am confident that we will have a steadfast partner in Secretary Bernhardt who will stand up for our farm, ranch, and timber communities in Oregon and across the West. I applaud the Senate for confirming this excellent nominee, and look forward to working alongside Secretary Bernhardt to improve the health of our forests, increase access on public lands, help bring water security to our irrigators, and create jobs in Oregon’s rural communities." Executive Vice-Chairman Scott Tipton (CO-03): "As a native of the 3rd Congressional District in Colorado and a career advocate for responsible multiple use of our public lands, David is well suited for his new role. He is a dignified public servant, and has shown his dedication in his roles of Deputy Secretary and Acting Secretary of the Interior. I am excited to continue working with him on public lands issues. I thank the Senate for a quick confirmation and wish David well in his new full time job." Vice-Chairman for Indian Affairs and Oceans Don Young (AK-At Large): "I am very fortunate to have previously met with David Bernhardt in his capacity as Acting Secretary, and was impressed by his great knowledge on issues importance to Alaska. Mr. Bernhardt is an honest, hardworking man and has been a tremendous asset to the Department of the Interior. I applaud my friends in the Senate for confirming Mr. Bernhardt as our 53rd Secretary of the Interior. I wish Secretary Bernhardt the best of luck as he runs this important agency, and I am confident he will continue to be a great partner for the State of Alaska." Chief Rules Officer Dan Newhouse (WA-04): "Congratulations to Interior Secretary David Bernhardt on his Senate confirmation. I look forward to working with Secretary Bernhardt on natural resource matters that are key for my constituents in Central Washington, namely the delisting of the gray wolf and equipping small farming communities with surface water as they face depleted groundwater supplies in the Odessa Subarea." Chief Agriculture and Business Officer Doug LaMalfa (CA-01): "Today, I’m very pleased the Senate has confirmed Secretary Bernhardt to head the Department of Interior with bipartisan support. It’s a testament to the wealth of knowledge and experience he brings to the department. Through his time as Acting Secretary and Deputy Secretary, David Bernhardt has demonstrated to me that he understands the issues that are impacting Northern California and the rest of the country, and I look forward to working with him to meaningfully improve the way America manages its public lands." Chief Water and Wildlife Officer Tom McClintock (CA-04): "Today is a great day for America. David Bernhardt will be an excellent Secretary of the Interior." Senator Kevin Cramer (ND): "I appreciated meeting with Mr. Bernhardt and explaining the issues facing North Dakotans. His commitment to reducing the heavy hand of the federal government is greatly appreciated, and I look forward to working with him to produce real results back home." Senator Mike Crapo (ID): "David Bernhardt is well qualified to lead the Department of Interior, and his list of career accomplishments is exemplary. I congratulate Mr. Bernhardt on his confirmation, and look forward to continuing to work with him in a collaborative manner on topics important to Idahoans." Senator Mitt Romney (UT): "I recently met with Mr. Bernhardt to discuss a wide range of issues impacting Utah, such as the need for greater state and local involvement in public lands issues. Based on our discussion and his years of experience managing federal lands, I believe he has a solid understanding of issues affecting Utah and Western states. I will support his confirmation and look forward to working with the Department of the Interior to ensure that Utah has a voice in public lands decisions." Senator Jim Inhofe (OK): "I was proud to vote to confirm David Bernhardt today for Secretary of the Interior. Having strong leadership at Interior is important for responsible, efficient development of energy, managing our many public lands and supporting our tribal communities. David is the right man for the job and I look forward to working with him in his new role." Senator John Thune (SD): "Secretary Bernhardt will be an important force at the Department of the Interior. I supported his nomination because I know he will continue to roll back the burdensome regulations put in place during the Obama administration and pursue responsible policy governing our nation’s public lands. I’m looking forward to partnering with Secretary Bernhardt as the department works with tribes in South Dakota, encourages good stewardship of our national parks, and promotes a multiple-use approach to managing our public lands that ensures our lands and natural resources are preserved for future generations to enjoy." Rep. Tom Emmer (MN-06): "I applaud the confirmation of David Bernhardt to serve as the Secretary of the Interior. Through his various roles at the Department, Secretary Bernhardt has developed an expertise few have. His actions as Acting Secretary have shown his understanding of the priorities of the Department and his ability to balance conservation, management, and the development of federals lands. I congratulate Secretary Bernhardt on his confirmation and know he will serve our country well." Rep. Pete Stauber (MN-08): "I applaud the Senate for confirming the highly-qualified Secretary Bernhardt. There is no one more experienced and I am excited to work with the new Interior Secretary on priorities to northeastern Minnesota, such as development of our precious metal resources and management of Voyageur’s National Park and Grand Portage National Monument." Rep. Ken Calvert (CA-42): "David Bernhardt possesses the work ethic, knowledge and leadership qualities that are necessary to effectively run the Department of the Interior. His robust experience in natural resource management and, specifically, California’s water resources are unmatched. I want to extend my sincere congratulations to David and look forward to working with him on the important issues facing our nation." Rep. Paul Cook (CA-08): "I’m pleased the Senate has confirmed David Bernhardt to be the next Secretary of the Interior. He has extensive knowledge of the challenges impacting public lands in California and the West, particularly when it comes to combating and preventing wildfires. I’m confident he’s the right person for the job and I look forward to working with him." Rep. Duncan Hunter (CA-50): "This is great news for both the Department of Interior and Americans all across the country who care about our public lands. I believe Secretary Bernhardt is a man of action, not just talking, and will bring a sense of urgency to the Department in implementing policies that focus both on adhering to federal law while, at the same time, utilizing common sense. These goals are not in conflict as many bureaucrats seem to believe and Secretary Bernhardt is someone who understands this very well. I look forward to his leadership." Rep. Kelly Armstrong (ND-At Large): "David Bernhardt’s record of standing up for responsible stewardship of our country’s natural resources will be an asset to the Interior Department and the country. I look forward to working with him to advance North Dakota’s priorities, including public land management and our commitment to Native American communities." Rep. Greg Gianforte (MT-At Large): "David Bernhardt has the background, experience, and understanding of Western issues that will make him an outstanding leader at the Department of Interior. I appreciate the Senate’s quick confirmation of this well-qualified nominee and look forward to continuing to work with Secretary Bernhardt on issues important to Montana." Today, the United States Senate confirmed David Bernhardt to be the 53rd Secretary of the Department of the Interior (DOI) with a bipartisan vote of 56-41. The Senate has now confirmed David Bernhardt three times. He has served honorably at DOI as Solicitor, Deputy Secretary, Acting Secretary and now Secretary. As Secretary of the Interior, Bernhardt will lead an agency with more than 70,000 employees who are stewards for 20 percent of the nation’s lands, including national parks, monuments, wildlife refuges and other public lands. Secretary Bernhardt has been a model public servant for nearly fifteen years. During his tenure with DOI, David has worked diligently to increase hunting and fishing access, ensure clean water for future generations and empower local decision-making. David is a champion for sportsmen and rural communities. Mr. Bernhardt was the general counsel for a Western Caucus Congressman and the Third Congressional District now represented by Congressional Western Caucus Vice-Chairman Scott Tipton. Click HERE, HERE, HERE, and HERE to view press releases from the Congressional Western Caucus and Senate Western Caucus in relation to Mr. Bernhardt's various nominations. On March 11th, the White House sent Acting Secretary David Bernhardt’s nomination to be the next Secretary of the Department of the Interior (DOI) to the United States Senate. On March 28, 2019, Acting Secretary of the Department of the Interior, David Bernhardt testified at a Full Committee hearing before the Senate Committee on Energy and Natural Resources on his nomination to be the next Secretary of the Interior. For witness testimony, video and more information on the hearing click HERE. On April 4, at a business meeting, the Senate Committee on Energy and Natural Resources voted to advance the nomination of David Bernhardt to be Secretary of the Interior with a bipartisan vote of 14-6. Altogether, Interior’s energy and mineral portfolio contributed an economic output of over $150 billion and supported an estimated 740,000 jobs nationwide in 2018. Approved solar projects on 43,700 acres of public land. Set a new record with $1.1 billion in 2018 onshore oil and gas lease sales. With this revenue, $500 million has gone back to states, providing support to key institutions like hospitals and public schools. Crafted a regulatory environment that helped create 60,000 new mining jobs in 2018. Significantly cut the time it takes to process Applications for Permit to Drill (APDs) on Federal lands by over 50 percent. Smashed the record for high bids received for offshore wind auctions, with $405 million in winning bids received for the December 2018 Massachusetts offshore wind auction. BlueRibbon Coalition, Inc.: "Having an avid sportsmen at the head of the Interior who understands wildlife and natural resource issues and management is a huge plus," said President of the Boone and Crockett Club Timothy C. Brady. "When it comes to those things that are important to sportsmen, including healthy populations of fish and game, and open access to them, having a proven leader like Bernhardt makes all the difference." Competitive Enterprise Institute: "President Trump has made a great choice in nominating David Bernhardt to be Secretary of the Interior," Director of Energy Policy at the Competitive Enterprise Institute Myron Ebell. "He has done an outstanding job as deputy secretary in implementing the president’s energy agenda. The immense challenges in reforming Interior’s dysfunctional federal land agencies require someone of David’s experience, skills, and dedication. He’s a reformer. He’s done an outstanding job as deputy secretary, particularly in implementing the president’s energy agenda on public lands and offshore areas."